Last Tuesday, the district leaders for the 76th Assembly District Part B (the neighborhood of Yorkville), Ben Wetzler and Kim Moscaritolo, organized a community forum on empty storefronts. They invited Andrew Fine from the East 86th Street Association and Manhattan Borough President Gale Brewer to comment on the rash of empty storefronts throughout the neighborhood. What's the issue with empty storefronts? There isn't a full survey of empty storefronts throughout the city. From the New York Times, Councilmember Helen Rosenthal estimates empty storefronts along Broadway in the Upper West Side at about 12%; Andrew Fine estimated around 20% in the area of Yorkville. Vacant New York, which is compiling a crowd-sourced database, estimates 30% along 14th Street. Whatever the general figure, it's clear that there are certain areas where retail storefronts have been sitting empty some time. High potential rents - Some large corporate renters with deep pockets can pay high rents - retail chains like Duane Reade or 7-11, restaurant/coffee chains like Starbucks, or banks like Chase. Smaller tenants like mom-and-pop stores can't meet the same level of rent. Long commercial rents - Given that the large chains can't fill every storefront, why doesn't the rent come down in spaces that haven't attracted them? Well, in many cases, leases can be 10-20 years or more. As such, landlords would prefer to hold out for the higher rent, rather than sit waiting with the lower rent, so they'd prefer to have the space sit vacant -- even for years -- if it means making significantly more in the long term. Tax incentives - It's difficult to get a clear answer on this point, but it seems that there are some tax incentives that allows the owner vacant storefront to deduct the value of the lost rent from the taxes on their income. If you're a large property owner with multiple properties, the empty storefronts reduce the taxes on the full storefronts. What does this have to do with Indie Theater? Rising commercial rents impact all of us: commercial rents impact all rents, and this empty storefront issue is just one aspect of the larger gentrification that is displacing people and killing local businesses. Independent theater venues are in commercial spaces: although storefronts are the most visible aspect of this, the same incentives drive rents on independent theaters and other cultural spaces. Right now, landlords have no incentives not to pursue whatever the most high-profit use of the space is. Starbucks and Chase will always be more profitable to landlords than culture. Wasted Resources: Simply put, it's very frustrating that arts and cultural space is so limited when so much space is sitting empty. Document the problem: As noted earlier, right now we only have specific neighborhood-by-neighborhood information gathered by a few elected officials. Vacant New York is gathering a crowd-source database for Manhattan. The advantage? This is something you can do right now. Go and report any local vacant spaces you see. Arbitration to help landlords and tenants come to agreements over new leases. Vacancy Tax: As mentioned above, one of the keys driving this retail rent spike is that there's no disincentive to the landlords leaving the spaces empty. The Vacancy Tax proposal is straightforward: tax empty spaces that don't get filled after a certain amount of time. Unfortunately, any change to the tax code has to go through New York State, and the State legislature doesn't seem interested in tackling the problem. Commercial Rent Control: What the Vacancy Tax aims to do through incentives, Commercial Rent Control would do through rules. Similar to the rent control has existed (at least in some form) for residential rents, this would create limits on how much rent could be charged and how much it could go up year over year. Like the Vacancy Tax, it would need to go through the State legislature, and it is also among the more comprehensive solutions. Protective Zoning: Although this approach doesn't seem to have caught the attention of New York lawmakers as much as the other solutions, protective zoning for specific small businesses is another approach that might help. For example, San Francisco created a Legacy Business designation to protect locally owned businesses with roots in the community; at the League's Meet the Candidates event, Councilmember Laurie Cumbo spoke about using the city's "Cultural District" designations in a way that actually protected the cultural institutions. At the forum, Borough President Brewer mentioned specific aspects of zoning that can protect small businesses, like requiring smaller storefront lots rather than combining them to create one large lot. Join us at our next general meeting -- open to members or any interested individuals or partners! Working on our anti-sexual harassment guidelines project. Recapping recent changes announced by Actor's Equity Association regarding the Showcase Code. Preparing for our An Artist's Guide to Participating In Your Community breakout session at The Field's Activate Equity gathering on Saturday, March 17th. Preparing for a series of panels as part of a US-Italian theater conference. We'll be at the Signature Theater's second floor from 7-PM -- join us and weigh in! Fighting Sexual Harassment, general meetings, and much more! The League has big plans. Expanding our subsidized rehearsal space program. 2017 was an active year for the League! We led advocacy and community board trainings across the city, campaigned for dozens of city council candidates, won our first-ever grants, and stood in solidarity with the #resist movement. But we can't do it alone! We're an all-volunteer organzation and we rely on the passion and energy of our volunteers to do the work. In 2018 our resolution is to be an even more transparent and inclusive organization. Learn how you can get involved below! Fighting sexual harassment is going to need systemic change in every sector, including Independent Theater. As part of developing new processes for protecting theatermakers and ensuring a safe working environment, we've partnered with Rachel Dart's Let Us Work Project to gather specific data on sexual harassment in Indie Theater, and what happens next. As part of our commitment to transparency, we're going to have monthly League meetings, open to the public. Every month on the 3rd Monday of the month, we'll meet to updates our members on our work and strategize going forward. 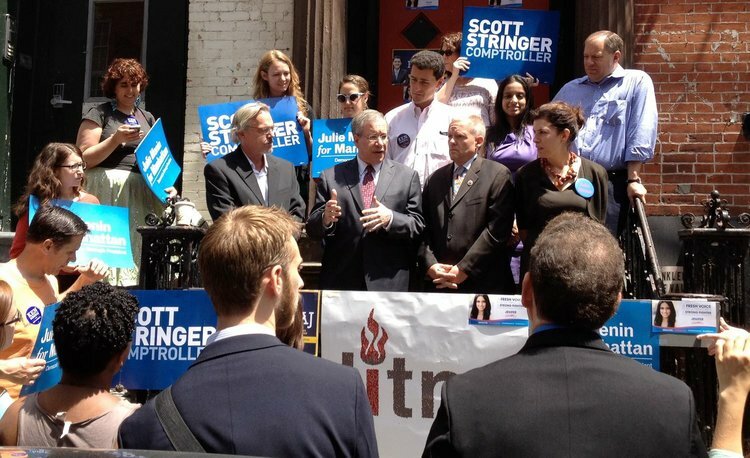 New York City's Comptroller Scott M. Stringer is a familiar face to many in the indie theater sector. He has been showing up to League of Independent Theater events since 2009 and has helped guide our mission to speak directly to our elected officials about the needs of small theaters and the artists working in them. While Mr. Stringer is not facing a challenger in the Democratic primary on Sept. 12, 2017, he appears to be running against a Republican, a Libertarian, and a Green Party candidate in the general on Nov. 7, 2017. He is a passionate arts advocate and we are proud to support his reelection bid. Why is independent theater important to New York City? Supporting New York’s thriving independent theatre scene is essential to preserving our City’s status as the cultural capital of the world. I have been a passionate advocate for the arts throughout my career as a public servant, including assisting in the formation of the League of Independent Theater in 2009. Unfortunately the incalculable benefits theatre and arts programing provides to the fabric of our city is under threat. The Trump Administration’s proposal to defund the National Endowment for the Arts would result in the loss of millions of dollars of funding for NYC cultural organizations, threatening jobs, tourism, and arts education programs. To help galvanize opposition to these devastating cuts, my office recently issued a report -- Culture Shock: The Importance of National Arts Funding to New York City’s Cultural Landscape – showing how the NEA has delivered over $32 million in grant funding to theatre groups within the City over the past sixteen years. These grant dollars have helped produce enduring works of art and have enriched the lives of so many New Yorkers. If reelected, I will continue to fight for the NEA and for independent theatre so that our city can remain a vibrant, and thriving center for the arts. What is different about campaigning in 2017? Despite serving in office during periods of great turmoil and change, the stakes have never been higher. The administration in Washington poses an existential threat to constituencies and services throughout our city. Insulating New York City from new and disastrous policies affecting immigration, climate change, and financial security is essential to preserving the character of the City we love. Scott M. Stringer, the League's endorsed candidate for Comptroller, speaking with the League's Managing Director, Guy Yedwab, and the League's endorsed candidate for District 35, Laurie Cumbo, on the steps of the Kraine Theatre in the East Village. What makes you an arts-friendly candidate? In my first months as City Comptroller, I released a report showing how schools across our city were in violation of New York State laws mandating arts education, resulting in deeply unequal access to arts education for children living in some of the City’s lowest-income communities. My report, “State of the Arts: A Plan to Boost Arts Education in New York City, revealed that as many as 28 percent of schools lacked a full time, certified arts teacher and that ten percent of schools reported having no dedicated space for arts instruction. In the world’s cultural capital, one out of four middle and high schools lacked partnerships with the City’s many renown arts and cultural organizations. As a direct result of the report and the advocacy of arts organizations from across New York, the administration allotted $23 million dollars to arts education in schools and hired 120 permanent arts teachers. Knowing how exposure to the arts – including independent theatre -- can transform the lives of children, I am enormously proud to have helped bring quality arts programing to schools across the city. What is your favorite place to unwind in your district or in the city? What is your favorite treat after a long day of campaigning? 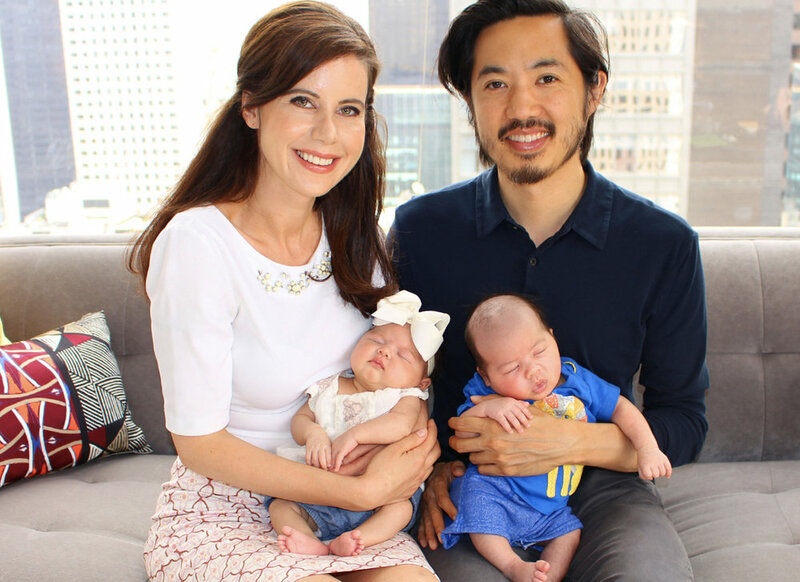 After a long day of events, it is great to go with my wife, Elyse and our two boys, Max and Miles to a favorite playground and restaurant in a NYC neighborhood. How can League members get involved in your campaign and who should they contact? If reelected I pledge to continue to advocate for the arts in new York City. Our cultural heritage and pioneering arts scene is what makes this city a vibrant center of the creative economy. I would be honored to have the support of members of the League of Independent Theater. You can help me advance our goal of working towards a thriving, affordable New York City by contacting our Field Director, Nicole Alesio, at nicole@stringerfornewyork.com to get involved! As we get closer to the local primary on Sept. 12, 2017, we spoke at length with Christopher Marte, who is the League's endorsed candidate for District 1. You can see how hard he is working on his campaign and his legit indie theater cred. If you have any time this week, please get out and help his campaign by handing out flyers or phone banking. Please tell us about a plank on the League's Performing Arts Platform that affects people in your district that you plan on tackling when you are in office. How will you do so? There’s a crisis of overdevelopment happening almost all across District 1. It’s becoming increasing difficult for the artistic community to afford to live in one of the neighborhoods where they have historically thrived. I will implement protective and community-based zoning to protect the history of the District, and look out of it’s future. Zoning like the Chinatown working group plan accounts for the rich cultures of Lower Manhattan, and will put in place further protections against tenant harassment that can displace hundreds of residents, many of which are artists. What can the city do to preserve and grow its stock of performance and rehearsal spaces? We need to improve the communication between different community groups and organizations, and work to solve the vacant storefront crisis. While space has always been tight in the City, everyday as I criss cross the District and knock on doors, I pass dozens and dozens of empty stores. They vary in size and accessibility, but while they wait for a full-time lease, I will work with local business and building owners to strengthen their relationship with the performing arts. More collaboration will be beneficial to both. Why is independent theater important in your district? The easiest example to call to mind is Sam Shepard. When he moved to New York, it was the Lower East Side that gave him the most room to experiment. The affordability of the neighborhood and lively independent theater scene was an integral part to his development as a playwright. The overlapping of cultures of District 1 have attracted generations of artists. My City Council office will foster this diversity and preserve the artistic community that has always made its home here. What made you decide to run for this office? I decided to run for this office because so many of the issues across the District from sanitation, to waterfront resiliency, to historical preservation, to displacement, all had a common denominator - a passive City Councilperson. I started this race before Obama’s now-famous quote about picking up a clipboard and running for office, however it was the same sentiment that inspired me to run. I knew that there were problems in my District, but instead of watching them pass me and my neighbors by, I decided to stand up and run myself. I’ve lived in the same neighborhood my whole life and have watched it change for the better and for the worse. My love of my community is what drives me to work harder everyday to give my neighbors the voice they deserve in City Hall. What is something you discovered or were pleasantly surprised by about your district during this campaign? Have you had a moment that has changed you during your campaign? Everyday I feel changed by my campaign. Whether it’s a long conversation with somebody at their door, where they tell me about their family’s history in the District, or about a particular challenge they’re facing, these interactions always leave a mark. Even for people that think every politician is the same, after I tell them my story and they learn we went to the same school, or my relative lives in their building, we build a connection that’s more personal than political. I talk to hundreds of people a day, but even when it’s exhausting, it’s the most rewarding part of the race. Sometimes the grumpiest person to open their door can become the most enthusiastic supporter, and the potential for this transformation helps keep me going. There seems to be two types of voters -- those who have lost all hope, and those that have a spark for local politics that was never there before. Sometimes they’re the same person. A lot of the most engaged volunteers and interns on my team are people who have realized that this fight needs to start from the grassroots. It has to start from the bottom up. If we cannot demand transparency and honesty at a local level, then we cannot expect to find these morals reflected on a national level. For the voters that have lost hope, and believe the system will always be rigged against them, it’s important to communicate how much of a difference they really can make locally. There’s no electoral college, and close races will come down to just 10s of votes. Finding a way to engage voters outside of the issues they care about, and applying a national frame to this local race, has been very effective in reaching out to new or first-time voters. About 25% of my donors are artists from SoHo, to Chinatown, to the Lower East Side, to Tribeca. I think this is one of the communities that has been particularly inspired to become more politically involved after Trump because there were simultaneous changes happening in Lower Manhattan that threatened their quality of life as well. A lot of small galleries and theaters are facing unprecedented rent hikes, so they are already uneasy about the direction their neighborhood is going. And then when you see something so devastating happen on a national scale, it just amplifies these local issues even more. It’s been inspiring to have received support from some of the most creative minds in Manhattan, and their ideas have really helped build up my campaign. Tell us about a time when you directly helped an indie theater company or artist. My brother and I repurposed his fitness studio to help two indie artist perform Danny and the Deep Blue Sea. The two directors/actors came from California, so they didn’t have any connections in the neighborhood. They decided to just email a lot of small businesses in the area, and my brother was the only one who responded. This is why I strongly support more opportunities for collaboration and communication between independent theaters that need space, and small businesses that might be willing to offer it. You never know what connections are going to be made. Share with us a moment or scene from an indie theater show that has stayed with you and why. In 1997, I was fortunate to be apart of the First Fringe Festival Performance “Camino Real”. I played a dead child in the dream sequence. This show me the importance of street performances and the arts on the Lower East Side. If a play or movie was being made about you and/or your campaign, who would you want to play you and why? My team and I often hear a lot of Veep comparisons. There are days where I’m Jonah just because I’m so much taller than everyone else. Of course none of the characters are very likeable, but there are bits and pieces of each of them in all of us. Every now and then there’s an unexpected moment of chaos that you can only get over by laughing your way through it. Mr. Marte walking during Pride. How many pairs of shoes have your worn out so far while campaigning? Any funny stories you'd like to share? I’ve gone through 5 pairs and am currently on my very worn 6th. According to my phone I walk around 26 miles a day, and climb over 80 flights of stairs, which definitely makes me aware that I’m lucky to be a younger candidate. Since most of my day is spent door knocking, the most imaginative parts of the day can be hearing how my interns are able to get into buildings. When every vote counts and your staff knows it, they’ll find any back door or backstory that will get them to the elevator bank. One of the staples of my campaign is Scarr’s pizza. It’s co-owned by one of my friends growing up, and is a real Lower East Side type of place. The music is always great, and sitting in the back under the air conditioner with a couple slices of pizza and my staff and interns is always the best way to end a long day of canvassing. Make your direct pitch to get LIT members to help in your campaign in the primary and/or the general. What do you need? How can they get involved/who should they contact? When are the best days and times to get involved? Running against an incumbent, the regular challenges of campaigning are made a little more difficult. However Lower Manhattan has a long history of resiliency and perseverance, and we have seen the impact the amount of local activism has had on this campaign. When you knock doors and write letters with us, you’ll be alongside a team that’s dedicated, passionate, and has proven people wrong every step of the way. You can contact my campaign at martefornyc@gmail.com to get involved in a race that will defend the oldest part of the City. The primary for the next local elections is on Sept. 12, 2017 and we are working to get the League’s arts-friendly candidates into office. Marti Speranza is the League's endorsed candidate for City Council District 4. She impressed us at our Meet the Candidates Forum earlier this year. We were doubly impressed by her Arts +Culture page on her campaign site and hope other NYC candidates follow her lead in presenting ideas on these issues in their campaign literature. I plan to sign onto the City Council’s City Spaces legislation to create a searchable database of underutilized community and city-owned spaces that can serve as performance and rehearsal spaces. Marti Speranza, left, is the League's endorsed candidate for City Council District 4. I believe in the power a progressive city government that makes a difference in people's lives. Making the right choices on housing, education, transportation and the environment is key to building such a city, and that’s why I’m running. If elected, I will work to keep New York on the forefront of positive change and innovation. I feel grateful to live in a city that is an epicenter of culture, and District 4 is home to many of the cities’ most important institutions. From Carnegie Hall to the Museum Mile, we need to promote the arts that keep our city vibrant and cultured. I have a plan to promote the arts, including expanding the Theater Subdistrict Fund to include arts organizations with budgets below $250,000/year and working with the many arts advocacy organizations in NYC to fight for the classroom space and funding schools need to provide their students with a rich education in music, drama, visual arts, and dance. I recently received the endorsement of the United Federation of Teachers (UFT), and I look forward to standing with LIT and UFT to promote the arts in our district. What is your favorite place to unwind in your district or in the city? My favorite place to unwind after a week of door knocking and phone banking is Bryant Park. The park holds a lot of sentimental value for my family — I married my husband, Rod, at the library there. Now, we bring our twins, Gia and Leo, for picnics at the park. Make your direct pitch to get LIT members to help in your campaign in the primary and/or the general. What do you need? How can they get involved and who should they contact? When are the best days and times to get involved? Our campaign is built on conversations with the voters of District 4 -- it’s these direct interactions that inform our voters and will help us win the primary on September 12th! We need people making phone calls, knocking on doors, or doing visibility as a proud member of Team Marti to help us get the word out. You can call our Field Director, Alex, at 917-574-9400 to sign up for a shift, or you can sign up here. We’ll gladly take your help any day of the week, any time you’re available. You’re also welcome to drop by Team Marti HQ between 11am-8pm, Mondays through Fridays, or 12-5pm on the weekends. Thanks Marti and best wishes on the final leg of the primary! Our members who have worked on your campaign so far have enjoyed doing so. Reminder to League members: if you would like to help on other campaigns of our endorsed candidates, please fill out this form. And please remember to vote on Sept. 12! This week the League is starting a new segment called Profiles in Theatrical and Political Courage. These are interviews with people making an impact in both fields. Our first profile is with Robby Gonyo, the League’s Director of Election Engagement. As we get closer to the NYC primary on Sept. 12, we thought it would be good to hear how he uses his theater skills to make an impact on local politics. We hope you feel inspired to join Robby in working to get the League’s arts-friendly candidates in office. If so, please fill out this form to join LIT’s Advocacy Days. Tell us what you do in theater, Robby. I primarily identity as a director, it’s what I feel I’m most prepared for and capable to do, but I also act, produce, and do a good amount of sound design. I co-lead a company called Co-Op Theatre East, work often with the companies End Times and Amios, produce the independent theatre podcast Go See a Show!, and work with a lot of theatre talent making radio plays with DTC Radio, and my own horror fiction podcast, Apparitions. …and, of course, I’m LIT’s Director of Election Engagement! Arts and politics take it to the street. Robby Gonyo, LIT's Director of Election Engagement with Laurie Cumbo, the League's endorsed candidate for City Council District 35. How did you get in politics? What was your first campaign like and what surprised you? I went to college for Political Science…and quickly fell in with the theatre crowd, spending most of my time there, and eventually taking enough classes that I earned a second major in Creative Arts (there was no theatre degree offered). After school, I got a job working on the “Leave No Voter Behind” campaign for MoveOn PAC in 2004, identifying and managing community volunteers in Pennsylvania. The terrible truth of working on campaigns is that come November, you’re out of a job, so from there I was doing manual labor (putting in fiber-optic cables for the set of Chitty-Chitty-Bang-Bang on Broadway, actually) when, through a theatre connection, I was introduced to someone in Communications for the Majority in the NYS Assembly, and began to do research there. As part of my job, there was an understanding that during election season, we would all leave the State payroll, and go work for the Democratic Assembly Campaign Committee. But my first campaign came early: a special election was called just 8 months after I started, and I was asked to go with a small team to Long Island to help on a campaign in a tough district. The other side had a strong enrollment advantage, and we only had three weeks to get the word out about our new-to-politics candidate. But we pulled it out. It was pretty exciting. The thing that surprised me most was how normal everyone was. Which may seem weird, but when I say, ‘normal,’ I mean, everyone around me—all the campaign staff, the volunteers, the operatives in Albany, and especially the candidate—was just a regular person who wanted to get involved and do something to help their community. How is working for a campaign like making and performing theater? Talk about a time or two when this was something you experienced first hand. Oh man…campaigns are basically one big long performance—temporal and ephemeral, featuring all sorts of personalities working together for a short but intense period of time, and so much of the real work is done behind the scenes. But they’re also immersive performances, improvised, and the audience has a whole lot of agency in shaping the narrative! I’ve actually seen the effect of “theatre training” first-hand from my days working in politics. A former politician I worked with, who will go un-named, was notorious for being really, really bad at talking in public. This person was sent for training on how to control their voice to convey emotions, and how to use body language to get a message across. Basically, they were sent for acting lessons! I think the clearest connection, though, between politics & theatre, relates to connection with an audience. For my money, the most interesting and effective theatre is the kind that connects with me; I feel, even though I’m in the audience, that I’m a part of the performance, that it couldn’t happen without me. Just like a good performance can have you feeling invested in what happens to the characters, a good campaign will have you feeling invested in the outcome of the race, because you identify with your candidate. It’s why campaigns will often talk not only about policy positions, but about who the candidate/character is—where they grew up, personal stories from their friends and colleagues, etc. The difference is, in politics, once the curtain comes down on the campaign, someone’s going to be making public policy that affects the real lives of people in their district. All the more reason to feel invested in the outcome, if you ask me. What LIT campaigns have you worked on? Got any cool, interesting, or unexpected stories from that? This year, while petitioning for my local Councilman, the incredible and very supportive Jimmy Van Bramer, I met a ton of my neighbors and had great conversations about the ways in with JVB and his office had helped them out—and, I ran into two actor friends who I didn’t realize actually live in my neighborhood! Four years ago, I was on a corner in Fort Greene playing guitar to help attract people to come and chat with Laurie Cumbo, which was really fun. She was grooving along to my acoustic jams as she talked with potential supporters. I witnessed another interesting encounter that will be familiar to any theater people who have ever put out postcards for a show. A few weeks ago, as I was out petitioning with Chris Marte, he happened to notice a bodega where he knew that one of his signs had been covered by a competitor’s sign—and it just so happened, the young volunteers of the opposing candidate’s campaign were at that moment across the street, putting up more signs. Instead of getting upset, or angrily tearing down the posters, Chris calmly approached the volunteers from his competitor’s campaign, and explained to them that what they were doing wasn’t good politicking. He then talked with the bodega-owner (a friend of his, incidentally! ), who didn’t want to let the volunteers leave the opposing candidate’s posters up at all, but Chris convinced him to let them leave up their candidate’s poster, so long as they move them from covering his own. It’s such a simple thing, but I think it really speaks to Chris’s integrity as a candidate. An upstanding guy, and a friend of the arts: that’s why we support him! Christopher Marte, LIT's endorsed candidate for City Council District 1, with Robby Gonyo and other campaign volunteers. How can LIT members and other artists get involved in LIT endorsed campaigns? There are so many ways! The best way, though, is to get out and volunteer, even if just for a few hours. From now until September 12, all of our endorses candidates are going to be looking for all the help they can get! Knocking on doors and talking directly with potential voters is the absolute best way, but there are also letter-writing campaigns, phone-banks, visibility efforts (basically, just being out in the community reminding people who the candidate is, and that there’s an election! )—tons of ways! What would you say to me if all I feel I can do is read things on Facebook and Twitter and panic? How does working on local campaigns make a difference? And while it might seem that the answer to that question should be SO PROFOUND—”how am I going to single-handedly change the world and alter the course of history?!?!?! "—it’s actually so much more simple than that. The right thing to do is to DO SOMETHING. We can’t all be running for office; but we can all make a few phone calls for the people we believe in who are running. We can’t all be writing policy papers and lobbying for legislation; but we can all take a few hours to go out and knock on doors to support the people are doing those things on our behalf. We can’t all be on Community Boards; but we should all be able to make one or two local meetings a year to keep up on what’s going on in our neighborhoods, and be a voice for artists. Thankfully for all of us in the indie theatre community, LIT has done the work of identifying great candidates who are going to be our champions in city government—and we can all throw down, in some small way, to help out. Find out more by contacting me directly!!! Share some links to things. Got any LIT-centric GSAS podcasts?